If you’re looking for preparation, reviving, deep cleaning, or scratch removal products, you’ll find it here. We have a range of products including coating strippers, polishes, honing powder, crystallization products, efflorescence removers, and more. 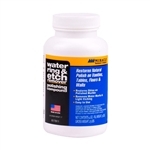 We carry products by manufacturers including Aqua Mix, Miracle Sealants, StoneTech Professional, 3M, and Abrasivos Aguila. When preparing a surface for a penetrating sealer or enhancing product, a coating stripper will remove tough coatings, lacquers, varnishes, and epoxy grout haze. To prepare a stone for polishing or shining, a honing powder will create an even, flat, and honed finish. It will also remove scratches, acid etching, and wear patterns. Different grit sizes will eliminate mild to deep scratches. For maintenance and reviving, we carry polishes, honing powder, and crystallization products that will bring a shine to the surface. Polishes come in a variety of forms including powders, creams, and pastes and are ideal for use on natural stone such as marble, limestone, travertine, and terrazzo. To remove scratches and for deep cleaning, we have many products available including acidic cleaners, efflorescence removers, grout haze clean up, honing powders, and polishing powders. Acidic cleaners will clean away hard water deposits, grout haze, efflorescence, and soap scum. Honing powders and polishing powders will remove scratches, etch marks, and light weight traffic patterns. More great stone care products can be found in the Sealers, Enhancing Products, Cleaners, and Stain Removers sections.